Terrorists choose the wrong place and wrong time to strike. They have dug their own graveyard. 1. It is election year. The in power, out of power, no chance of power - all politicians with half,quarter brain will be baying for terrorist blood. Any draconian bill will get passed this time in the assembly. Of course the short term impact will be - the terrorists will look for alternative professions and lie quietly. The long term impact will be - too much power with police,army will backfire in the long run. Then a peace loving government will come to power and clip its wings. 2. Those idiots attacked businesscapital. In the past few years business lobbying has started growing. So now enough businesses ( I am counting on you feuding Ambanis, Tatas and Birlas) will lobby for tougher security - and the half and quarter brains will comply and pass the laws even if they do not understand a thing. Well this is the name of my blog, inspired by a great book - Art of The Start by Guy Kawasaki. I bought this book on Nov 27,2006. ( I write the day I bought a book with an interesting event that day if I had one ) - and read it half way. But never finished it - gave me lot of crazy ideas and inspiration. Now I picked the book again and re-reading from the beginning. And suddenly it makes sense - every word of it. Earlier when I read this book it was as if I was reading the syntax of a language in a book. Now when I read the book it is as if I am coding and compiling and running it. If you are a wannabe entrepreneur, just starting like me, or a seasoned entrepreneur who eats VCs for breakfast - this is the one book you should have read back to back. I respect Mumbai more than Delhi. It is India's capital according to me - so many businesses, ideas, entrepreneurs have flourished here. 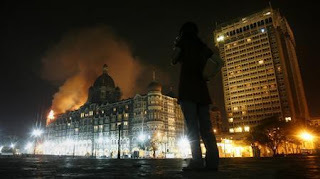 I got my coffee ready and picked up Indian Express and saw "Terrorists take over Mumbai" - I could not believe it. Thought it was a prank. Economic Times concurred. This is like a movie script. What is going on with our country? Knock Knock Sonia Gandhi, Manmohan Singh and Shivraj Patil - what are you guys doing? Enough of your vote bank politics and cuddling terrorists. Terrorists have gone from 0 to 1000s in the last 4 years - thanks to your inaction. If you cannot deal with it - quit. Take with you the crores that you got from Telecom licences and what nots and go holiday in France or Swiss - I don't care. Leave my country alone - and let an able administrator take over. Cannot watch this country bleed slowly to death.